Attach your files and send your ideas to our professionals, they will design them for you ready to order... easy. You do not need to Login or create an account to order. Simply enter your sizes, shipping details and upload... easy. Display Chief is very popular fabric banner for Exhibition, Expo and Indoor Hanging. Ideal for backgrounds popup displays, freestanding expandable display stands, covers and portable exhibit wall frames. 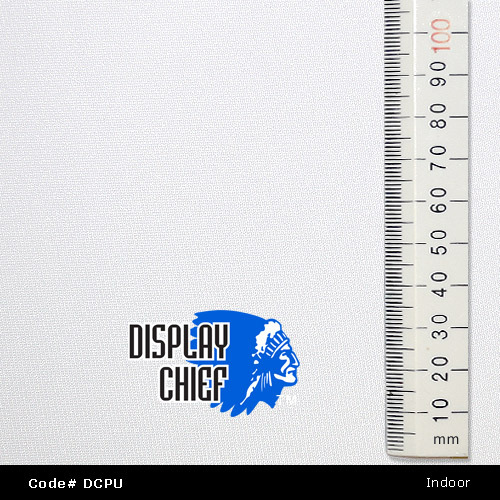 Display Chief is designed for Non-Flare professional photography and DISPLAY presentation. Foyer graphics, Commercial indoor print displasy and advertising promotions. Used by event hire companies, function centres, exhibitors, television and promotion agencies. Excellent graphics and Designed for Non-flare photography. Display Chief (DCPU) is a smooth polymeric fabric material designed for heat treated inking systems known as sublimation printing. If offers high quality graphics and is mainly used for exhibition walls, hanging banners, fitted to freestanding collapsible expo stands and display work such as framed images, photograpy backdrops and public use applications. Display Chief can be fitted with eyelet grommets, back side hook n loop fastener, sleeved pole pockets and hemmed edges	Display Chief is a single sided 'coated' for ink application one side only. Considered 81% opaque it remains one of the highest ratings for a non blockout material for see through effectiveness. Display Chief is highly regarded amongst display makers for	consistent quality, beautiful appearance, whiteness and vibrancy. #2 Gloss level. 25% sheen. Ideal for colors - non flare. NOTE: DCPU is not named as a stretch fabric. See Display Star Stretch Frame. Comparison: DCPU is minimum gloss level. Custom size to suit local frame popup, media wall dimensions, transports easily and can be washed. #1 Size is unlimited, large or small. Events may order one (1) piece or fifty (50) pieces all custom sized to suit their applications. #2. No mimimum dimensions, No minimum roll length. 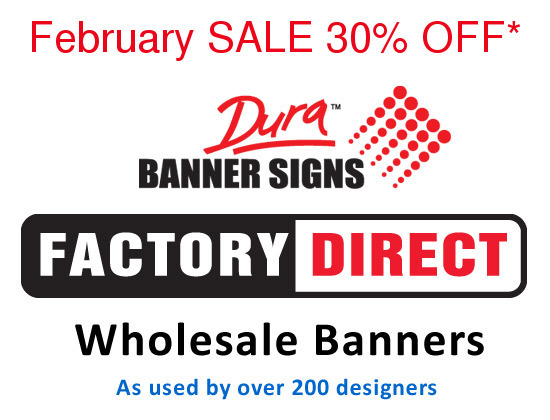 Note: Display Chief fabric printing banner is commonly purchased for expo and exhibition site applications such as 2 feet, 3 feet, 8 feet, 18 yards or interlocking units etc. Order to suit your client and budget set. 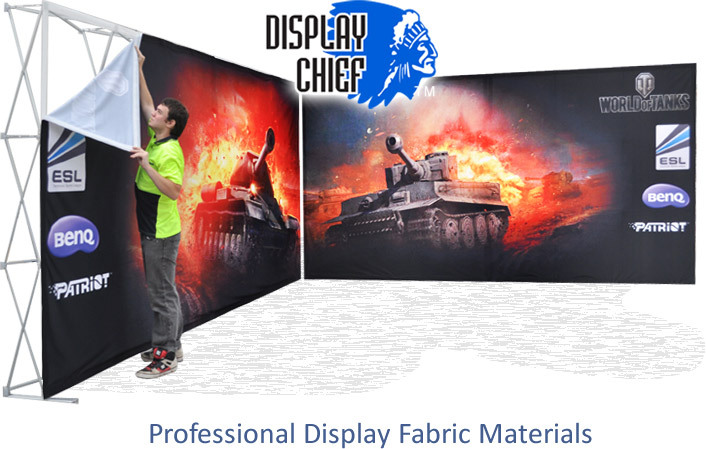 Display Chief is a Polymer Mercised Smooth Fabric with tight weave characteristics. 84% Semi Opaque with a bright whiteness, it is also used by photographers as a media interview backdrop due to its non reflective properties and depth of color. Display Chief DCPU banners can be manufactured with pole sleeves, hook n loop (velcro), eyelet grommets and specialized features custom to your needs. 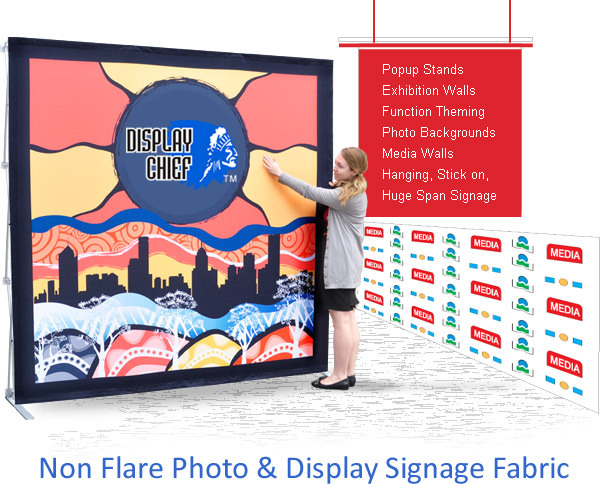 Use for large size high class graphics - Public Spaces, Exhibition stands, functions, media wall backdrops, step and repeat logos, school photography backgrounds, dance, theatre and television theming and set design. Need help with creating an order... we do it all for you here. Choose materials, sizes, fittings and options, then, add each line item to your quote. Press Start Order to begin the upload checks. 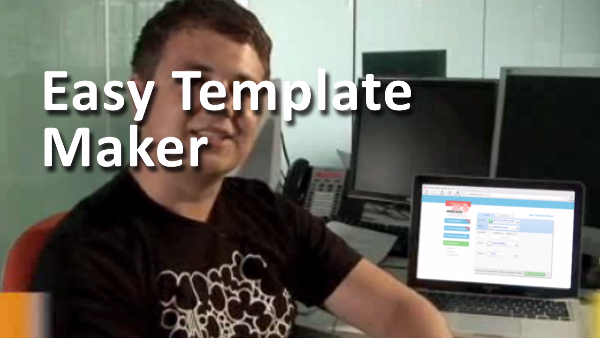 Design before you upload, the Easy Template Maker gives you the perfect Material Oversize (bleed), DPI, Graphics Safety Area, Sewing Lines & more. Learn how to make artwork that you can upload to print for material oversize specifications.